That Duro dress up there is Ann's — remember her Shwe Shwe blog? It's snowing here in Chicago today, but Lisa sent me a link to a pink shirtwaist dress that I wish I were wearing today. Outside. On a picnic. Without snow. Nora sent me a link to this alphabet fabric, but I ended up buying this one. Although now I think maybe I should have chosen this one, instead. Ah, well. 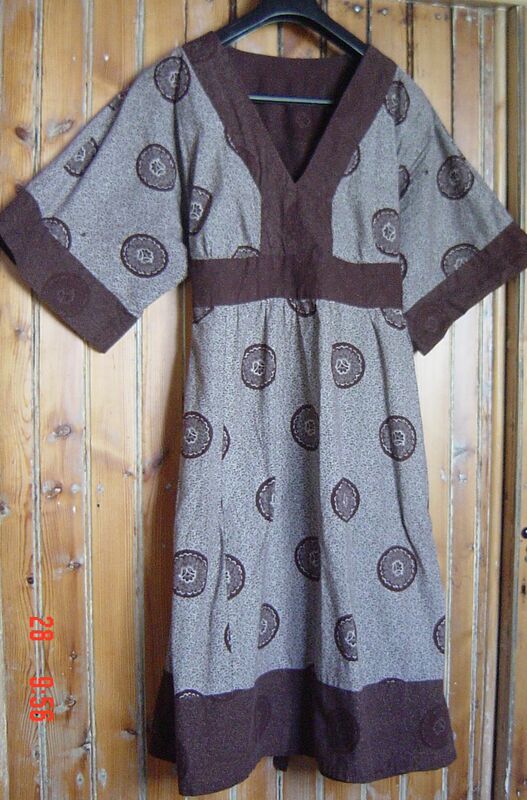 Did everyone see this stunning (and stunningly expensive) Claire McCardell pattern on eBay? This one, while not as dramatic, certainly went for a lot less … and ooh! Check out this pattern, it's quite nice and looks very easy … thanks to Jeanette for the pointer to the second Claire pattern! Completely Magnificent Dress from Sugardale. Oh! One more thing: Jen at MOMSPatterns.com is having another 20%-off pattern sale, now through midnight Monday. (I don't know what time zone Jen is in …) Use coupon code 'slacker20', she says, because she's been slacking this month. But, before I forget, this blog was given a very generous writeup in a new craft mag, Make It Mine! Thanks!